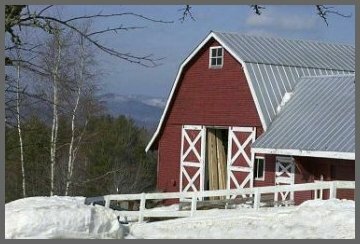 We converted this traditional red Vermont barn into our workshop in 1991. We have a stunning view of Sugarbush ski area directly across from us and can also see historic Waitsfield in the valley below. The scene sometimes seems surreal because it looks so much like a postcard. Common Road is a popular attraction for jogger's, hiker's and horseback riding due to it's beauty and eclectic mix of farms, inns and houses. We are very fortunate to work in this mountain valley and feel inspired by the surroundings when designing and producing our furniture. Inside the workshop, mastercraftsman Barry Hinchliffe chisels out a deep mortise in a Waitsfield sleigh bed. This mortise will eventually contain a tenon that is cut into the foot board panel. These time consuming techniques are almost a lost art these days but are worth the effort because they will ensure a bed that will last for generations. We like to keep the workshop as dust free as possible and have installed a central dust extract system that has connections to most of the machines. The sawdust is collected in a small room and provides excellent furnace fuel for the local potters.